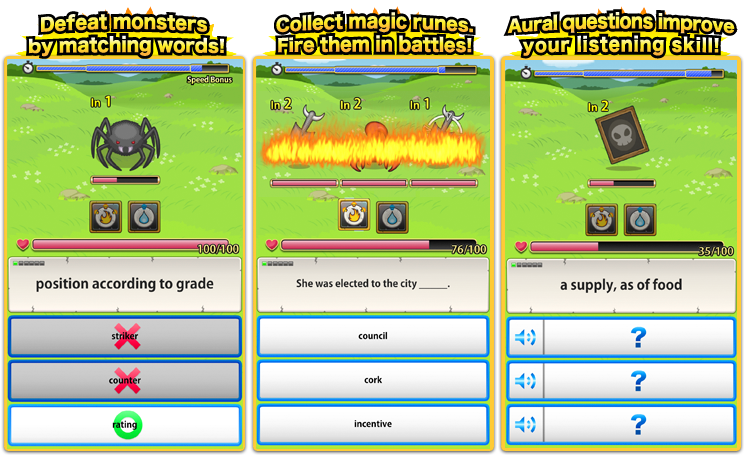 Words & Monsters is a free mobile game that integrates advanced learning science into a classic-style adventure game. Words & Monsters is set in Pangia a beautiful world that is now, sadly, dominated by fierce monsters. Long ago an evil sorcerer broke all of Pangia's language into pieces causing mass chaos. The sorcerer created fierce monsters to scare the people into digging for treasure. Your mission is to empower and free the people by reconnecting the broken pieces of their language. Words & Monster's uses paired associate learning, where new words are paired together with their meanings; and spaced repetition, where new words repeat at increasing time intervals until they are fully memorized. 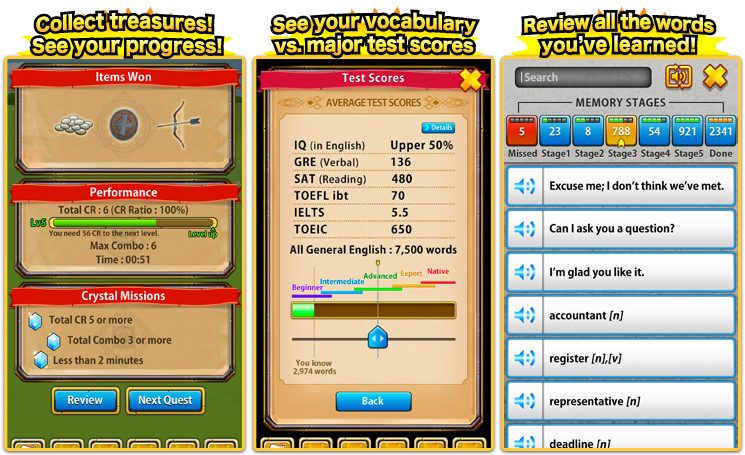 Combining these two approaches is absolutely the best way to quickly memorize huge amounts of new vocabulary. Research with thousands of college students shows significant test score increases for those who study with this system. Words & Monsters runs a patented semantic engine that automatically adjusts to your current ability and delivers the exact words you need to quickly improve listening, reading, speaking, and writing. The core database includes 14,000 words that provide 99 percent coverage of all written and spoken English including major tests such as TOEFL, IELTS, TOEIC, SAT, and the GRE. Additional courses are available for learning frequent phrases and special terms for different careers. Teachers may take advantage of the Classroom Network service to create groups, establish study goals, track progress, and generate quizzes. These advanced tools make it easy to integrate students' new vocabulary into your classroom. The Classroom Network also sponsors international tournaments for top groups and teachers to receive recognition and awards. Lexxica welcomes schools, businesses, and publishers to sponsor custom word lists designed to support their specific training and educational requirements. Any form of knowledge that can be written down can be quickly taught through our semantic game engine. Contact Lexxica for details.